Brian has entertained at more Golf Dinners than any other type of function... and he loves them! The Captain and Top Table guests will definitely get a mention! Abergele, Auchterarder, Baildon, Barlaston, Beamish Park, Belfry (several corporate events), Berkhamsted, Billingham, Blackpool North Shore, Blackwell Grange, Boothferry Park, Bradley Park, Bramhall, Bridlington, Bryn Morfydd, Burghley Park, Burton on Trent, Canwick Park, Chapel-en-le-Frith, Charnwood Forest, Cleckheaton, Cleethorpes, Clitheroe, Copt Heath (Warwicks union), Cosby, Crompton & Royton, Crosland Heath, Crow Nest Park, Davenport, Deane, Dunham Forest, Eaglescliffe, East Berkshire, Ellesmere, Forest Hill, Forest Pines, Fulford, Fulneck, Gog Magog, Grimsby, Halifax, Haydock Park, Heaton Moor, Hebden Bridge, Hessle, Heysham, Hickleton, Holme Hall, Hornsea, Horsforth, Horwich, Howley Hall, Hull, Hunley Hall, Ilkley, Ingestre Park, John O'Gaunt, Kings Lynn, Knott End, Ladbrook Park, Lancaster, Leeds, Lees Hall, Leighton Buzzard, Letchworth, Louth, Macclesfield, Mapperley, Marsden, Matlock, Mellor & Townscliffe, Middlesbrough, Moor Hall, Normanby Hall, North Hants, North Manchester, Oakdale, Outlane, Padeswood & Buckley, Peterborough Milton, Pontefract & Dist, Ramsey (Cambs), Retford, Rhos-on-sea, Ringway, Rishton, Romanby, Rossendale, Rotherham, Rothley Park, Royal Birkdale, Rushcliffe, Saddleworth (corporate event), Saffron Walden, Saltburn, Sand Martins, Sandwell Park, Sickleholme, Silkstone, Sitwell Park, Skipton, South Bradford, Spalding, St. Andrews Golf Association, St. Ives, St. Pierre (Chepstow), St. Thomas Priory, Stafford Castle, Stand, Stockport, Stoke Poges, Swinton Park, Tankersley Park, Teesside, Tunshill, Wallasey, Walmley, Warrington, Wearside, Werneth Low, West End (Halifax), Westwood, Wetherby, Worsley, York. Well maybe not! This was London Transport Golf Society's bash at the New Connaught Rooms in Covent Garden. 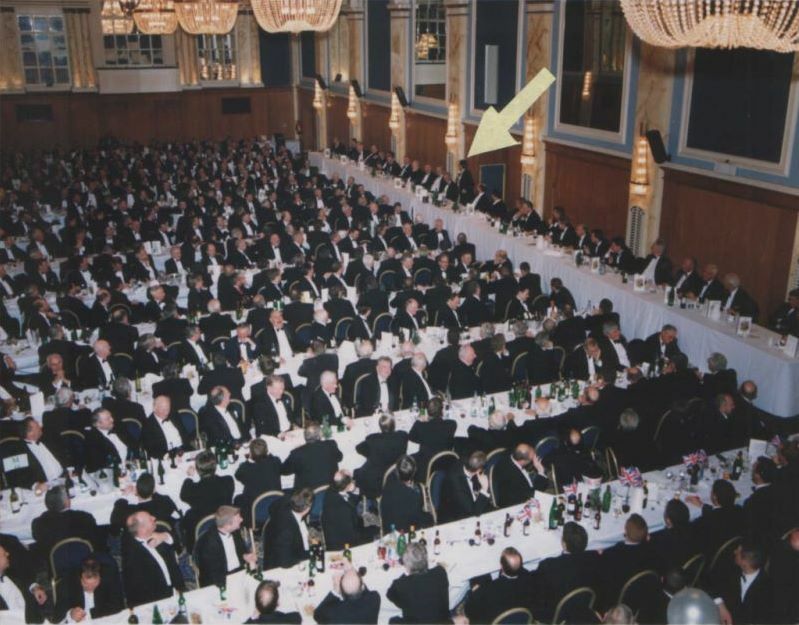 This was one occasion where he didn't mention all the Top Table guests by name. Brian is the one with the arrow in his head. Rothley Park Golf Club: "This was the first Presentation Dinner the Club had held and the night was an overwhelming success, helped in no small way by your fabulous contribution. I had several members approach me to say your routine made the evening, so a big "thank you" on behalf of the whole Club." Danny Spillane, General Manager. Saltburn Golf Club: "I write to say I have received numerous excellent comments about your wonderful entertainment at our Annual Dinner. Your Top Table mickey-taking, jokes and stories were greatly enjoyed by all and certainly ensured the evening was a resounding success. I have also been told by the Past Captains present that you were the best speaker we have ever had at Saltburn. Thanks again for a fantastic evening" Ron Agar, Captain. York Golf Club: "Many thanks for coming to my dinner on Friday and for entertaining us so well. I was very pleased with the way the evening went and comments from some of those present suggest it was one of the best dinners we have held, largely due to the excellent meal and your superb performance." Bill Hulley, Captain. Tankersley Park Golf Club: "Many thanks for a brilliant evening's entertainment. Please don't hesitate to pass on my details should you need any recommendation" Angus Ferguson, Captain. South Bradford Golf Club: "Everybody present commented on your contribution, you made a good night great. Again, a big thank you and good luck" Chris Farnell, Social Secretary. Rotherham Golf Club: "Thank you for a marvelous night's entertainment last Thursday. The feedback has been excellent. Everyone enjoyed the night immensely and that was down to your good self. Once again, many thanks" David Swift, Social Secretary. Gog Magog Golf Club: "Many thanks for your excellent contribution at our Gentlemen’s Dinner at the Gogs last Friday evening. I have received lots of very favourable feedback and I have to say that you rounded off a very memorable day for me personally. Many thanks again and good luck in the future." Mike Morrison, Captain. Teesside Golf Club: "I write to say how pleasurable your session was and that everyone was delighted with the content, in fact you went down as one of the best speakers we have had at Teesside Golf Club. A great evening, many thanks." Mick Fleming, Manager. Eaglescliffe Golf Club: "I have attended the Annual Gents Dinner for the last 25 years. Never have I experienced our main speaker being received so well. The content, delivery and particularly the humour were perfect for the occasion." Michael Sample, Secretary. Sand Martins Golf Club: "Thank you most sincerely for speaking at the dinner on Friday. You did a superb job Brian and I am most grateful to you for making our third Shareholders' Golf Day such a success. We had a great evening and I have received some excellent comments and thanks from everyone who attended." Andrew Hall, Managing Director. The East Riding Union of Golf Clubs: "Brian, you made the night, thank you" J. Lambert, President. Hebden Bridge Golf Club: "Absolutely brilliant! Many, many thanks for a superb evening's entertainment. Please feel free to invite other clubs to contact me if you need a recommendation" Geoff Holmes, Captain. Bradford & District Union of Golf Clubs: "Brian, you rounded off the evening perfectly" Bryan Webb, Secretary.